The LightRider English Style Bitless Bridle is a classy traditional looking bridle with a flat browband and noseband. Do you ride bitless but want a traditional looking bridle? The LightRider English Style Leather Bridles are ideal for shows, pony club, jumping, dressage, hunters and adult riding clubs. The English Style has a split headpiece that is flexible for comfort. All LightRider Bitless Bridles feature the unique chinstrap that snugs up when in use and releases when the pressure does (provided it is fitted correctly) The chinstrap will not tighten or 'clamp' down on the horse because the material flexes around the noseband ring. 90% of the pressure is on top of the horse's nose. LightRider Bitless Bridles are one of the gentlest bitless bridles available and are usually very well accepted by sensitive horses. 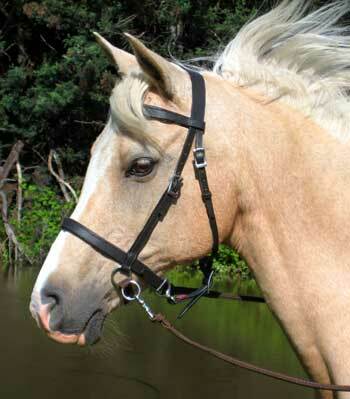 Unique Chinstrap: The purpose of the soft webbing chin strap is to help the noseband stay in place when pressure is applied to the reins - this keeps the noseband from twisting to give clear and direct communication. When rein pressure is applied the chinstrap becomes snug but does not over-tighten due to the type of webbing used, so 90% of the pressure is on top of the nose. Reins are not included with this bridle: Scissor rein clips are recommended for easy change over to the leading ring which enables groundwork/leading/lunging, or buy LightRider reins that include rein clips to match.